A small crowd gathered outside Beach House in Worthing to witness the unveiling of three restored plaques commemorating historical figures and events. One of the town’s landmark buildings, Beach House in Brighton Road has been in the town for nearly 200 years and boasts some notable visitors including King Edward VII. In a project by Worthing Borough Council and the Worthing Society, three blue plaques have been restored and were unveiled this morning (January 28) to a small congregation including Worthing mayor Paul Baker. The memorial plates commemorate King Edward VII, playwright Edward Knoblock and 60 Basque refugee children who stayed at the house in 1937. Following a welcome address from Kevin Jenkins, Worthing Borough Council executive member for regeneration, the mayor revealed the dedication to King Edward VII, who visited Beach House six times during his reign between 1901 to 1910. He stayed with his good friend Sir Edmund Loader, and was said to be known by townspeople as Teddy, spending time sitting on the pier with a newspaper. 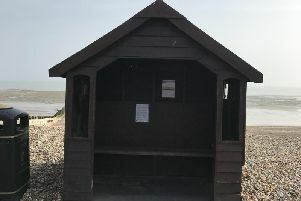 Worthing Society chairman Susan Belton told the crowd renowned playwright Edward Knoblock bought Beach House in 1917 and spent six years restoring parts of it, which is why he has been remembered outside the building. He was the first American to establish an international reputation with his play Kismet, which was popular in 1911. Susan said: “The blue plaque trail, which was instigated by our society, is a very visual way of representing our history and shines a spotlight on Worthing’s unique character. The third plaque was originally unveiled 12 years ago, and is a tribute to 60 Basque refugee children who were evacuated in 1937 during the Spanish Civil War and stayed at Beach House, being cared for by volunteers. Carmen Kilner, secretary of the Basque Children’s Association '37, made a speech before revealing the final plaque. Meirian Jump was one of the relatives who attended the unveiling. Her grandmother, Cayetana Lozano Díaz, was one of the 25 young women who came over from Spain to help look after the children. Her grandfather was a local reporter for the Worthing Herald at the time and met his future wife when he reported on the refugees’ arrival. Meirian said: “My parents came to the original unveiling of the plaques and now I am here today. My grandmother met my grandfather here in Worthing, so this is a very special occasion for me.It is really nice to be in the building where my grandmother was a young woman when she first came to the UK." Current Beach House resident Mascha Richards, who is also Worthing Society’s social secretary, and her husband Barry hosted refreshments afterwards which allowed the group to see inside the grand building. Some of the current owners are pushing for external funding to restore parts of the building which need extra care. Robin Biggs, who has lived at Beach House since June, said: “It deserves our care and it will soon be back to its former glory. The rededication is part of a number of projects to support Worthing’s heritage, including working with Worthing Borough Council planning department to protect heritage buildings on Bedford Row, work to improve the visibility of the RNLI memorial stone from the footpath south of Denton Gardens and refurbishment of some of the town’s blue plaques.